Digital Files Only. $25 is for Digital Files Only. Let’s see how many times I can repeat this before I annoy the heck out of you. Better that you’re annoyed now but know what you’re getting into than e-mailing me later with gripes about how come I’m not shipping you a physical printed copy of a day planner to your home address. So. Your $25 order is for digital files only (PDF of the day planner, PDF and MOBI files for the guidebook, all sent to you by email only). 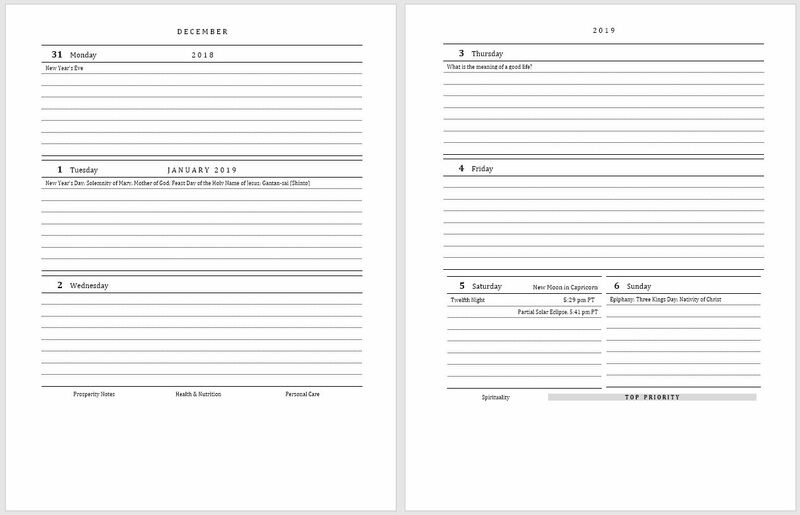 Click on the below link to view this PDF to see all single entry Divinity Page Options for 2019. Click on the below link to view grouped options. This is when several of the single entry options have been grouped together to form sets. Any of these options are still $25. 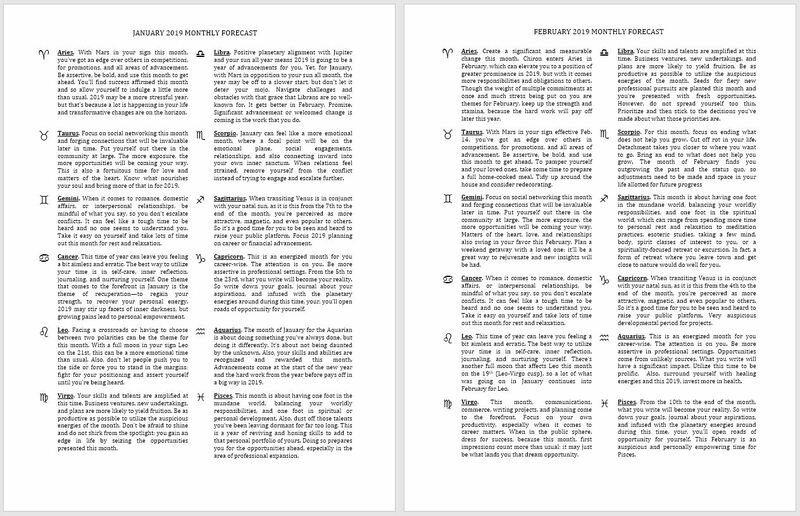 And this is what the “All Divinity Page Options” looks like (it’s a whopping additional 37 pages to your book). Click the below PDF to view. This is going to make for one bulky and heavy day planner, so I don’t recommend choosing the “All Divinity Page Options” unless you plan on leaving the brick at home. For a portable version of the day planner, the “All Divinity Pages” option is not advised. Click above link to view PDF. For an extra $5, we’ll customize your Divinity Page. That means you can ask for anything that’s not listed as a default option. Combine several of the options into something. Or you can choose any single card from the Spirit Keeper’s Tarot deck. 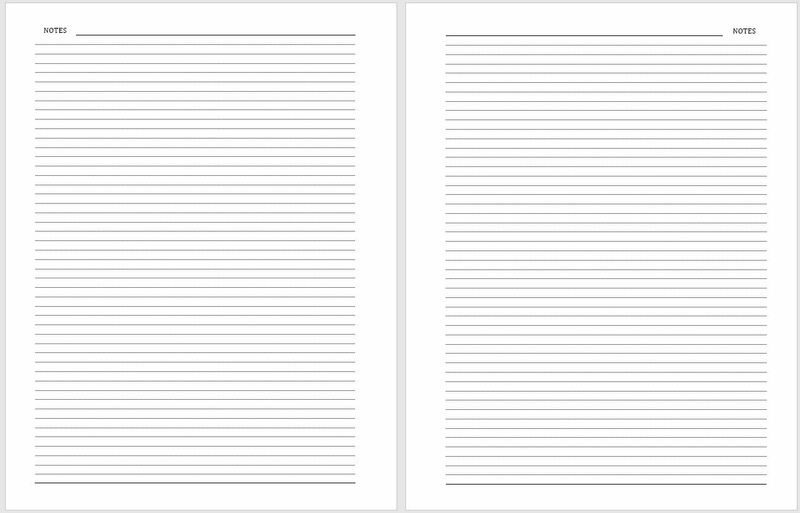 Or e-mail as a Microsoft Word Document file an odd number of pages that you want in the Divinity Page selection. You can use whatever you want but for legal reasons you must use only images that you own the copyright for or public domain images. In other words, if you send me images of copyrighted content that don’t belong to you, I cannot use it for your customized option. That may be something you can add on your own time, but I cannot add it for you as part of this day planner service offering. There is no need to send me your selection of which cover design you want. You get them all. You are going to get a whole bunch of image files you can use as-is for your cover designs (you get to choose your own cover!) or you can tinker with the image files I’ve given you to design your own planner cover. You will get the cover designs you see sampled above, updated to 2019 of course, plus many more! As with the 2018 day planner, your 2019 Metaphysician’s Day Planner will come with a complimentary 2019 Metaphysician’s Guidebook. The Guidebook will be as pdf only, sent as digital files to your e-mail inbox, but with a direct link to print a hard copy via Lulu.com for $10. That’s right, you can order a printed hard copy of the Guidebook from Lulu for $10. Upon our receipt of your order, your day planner will be delivered to your e-mail address on record in five (5) business days from the date of your order. The following are the new additions to the 2019 Day Planner. 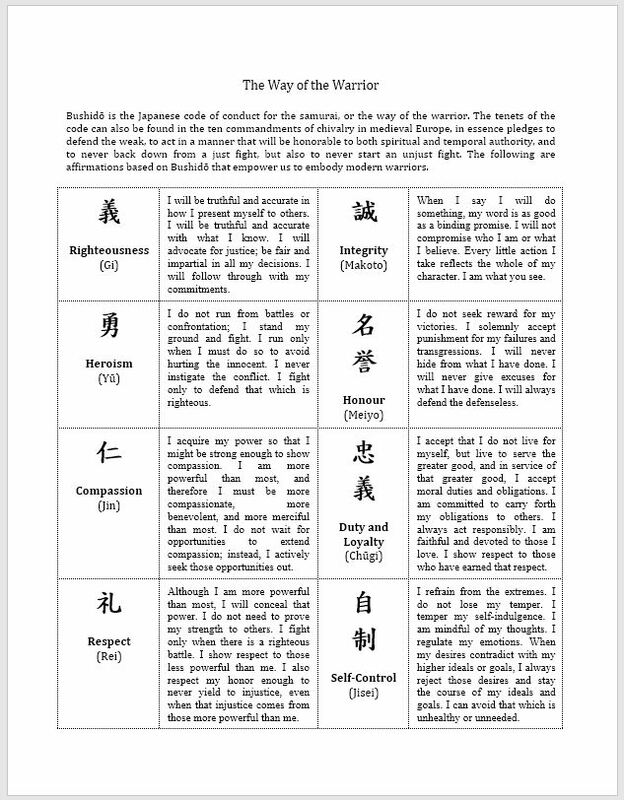 Bushido and warrior codes is something I’ve been kind of interested in as of late, so I’ve added a single page to the 2019 day planner that summarizes Bushido. I find it to be instructive and inspirational in terms of how I think about my lifestyle and my conduct on the day to day. 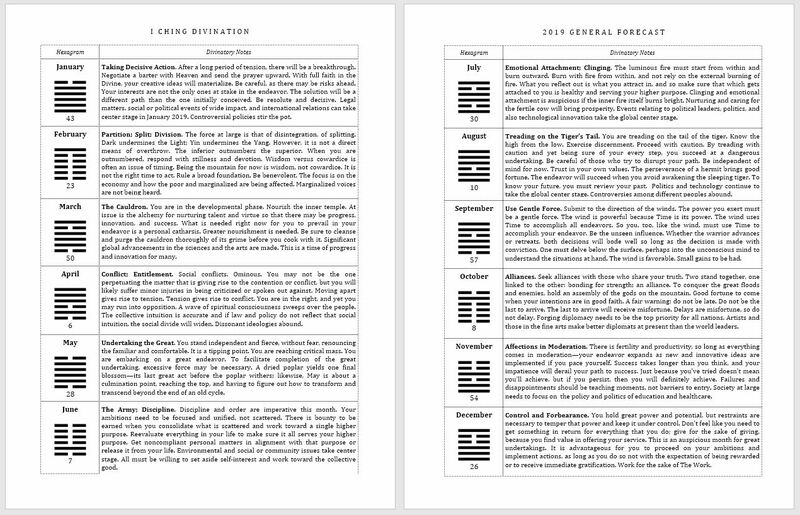 After the blank 2019 cartomancy forecast that you’d do yourself, whether you use tarot or oracle cards, there is a page spread of my I Ching divinations for the year of 2019 that’s going to be included in your day planner. I’ve also done monthly horoscopes and there will be twelve pages added to this year’s day planner for every month’s forecast. I’ve tweaked a couple of the old sections, so here’s an overview of the changes I’ve made. 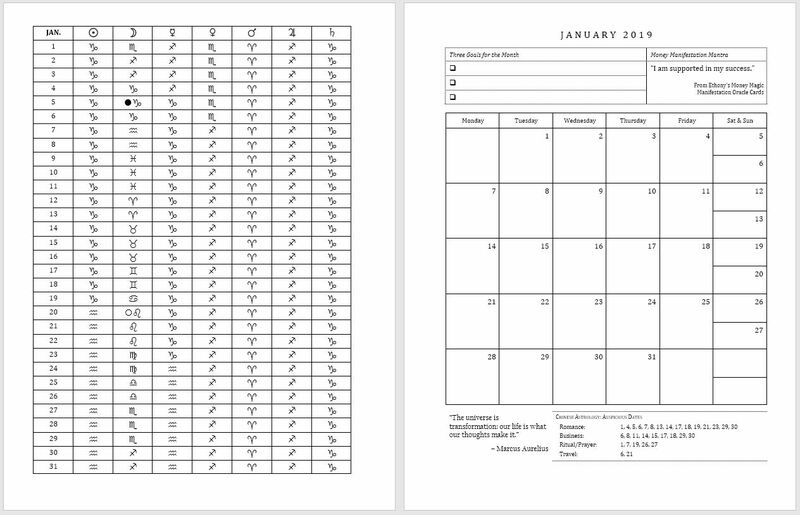 In the monthly planning section, we still have the ephemeris table for the month. Sign changes are all based on 12:00 pm on that given date, per Pacific Time Zone, North America. Note that for the new moon and full moon noted dates, you can then check the weekly/daily planning section of your day planner for the exact time the astronomical event happens. Then you can do a precise time conversion for yourself. Also, in the month-at-a-glance calendar page, instead of a blank divinatory forecast section for you in the top right corner, this year I’ve put one in, using Ethony’s Money Magic Manifestation oracle cards. Then in the bottom left corner, I’ve included an inspirational quote. As usual, the weekly/daily sections will include the major holidays for Buddhist, Christian/Catholic, Hindu, Jewish, Muslim, Pagan/Wicca, Taoist, and U.S. nationally recognized. For Jewish and Muslim holidays, dates noted on when observance begins at sundown and when it ends after nightfall. Every so often (rarely), you’ll also see a random question on a date, prompting you to think about the question presented. For example, see above, January 3, 2019. Minor changes to the bottom planning section have also been made. The free companion guidebook will offer some thoughts on how to use these sections and how I use my day planner. Please note the guidebook is largely the same as the 2018 guidebook. Finally, the design and layout of the notes section has changed. See above. Once you’ve got the PDF file for this, you can take it to a local print shop and get it printed out and bound. I’d use a sturdy stock for the front and back covers, something glossy even. 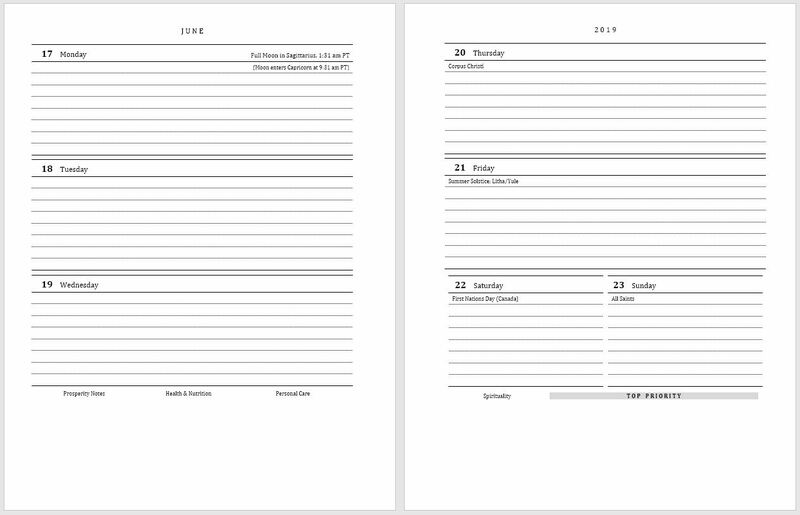 Then the printed calendar pages can be regular paper. You should be able to get this done for under $10. 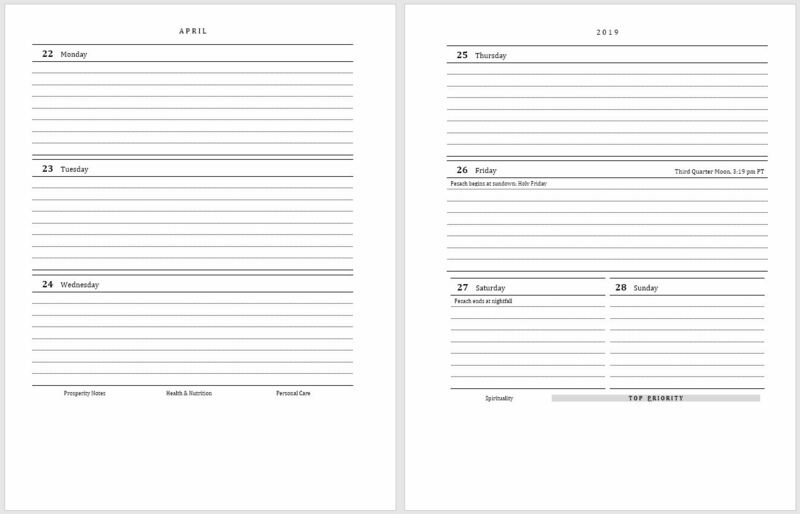 For instance, you can get your day planner printed and coil-bound at Lulu.com. Please be advised that all holidays and astrological events in the calendar are based from San Francisco, California, North America, using the Pacific Time Zone. Thus, depending on where you live, the event dates for astrology and astronomy could be up to one day off. However, for eclipses, key moon phases each month, etc., I give the exact time in the Pacific Time Zone that the astronomical event happens, so it’s very easy for you to do the necessary conversion. Can Non-North Americans still work with this day planner? Our customers are from all over the world. We’ve connected with folks from every continent through this day planner! However, just know that all dates and times noted in the day planner are keyed to North American Pacific coast time. If you can do the conversions for yourself, then all should be okay. If no day planner size is specified, then you will automatically get the US Letter standard size, at 8.5″ x 11″. If that is not what you want, then please specify planner size. If no divinity page selections are specified, then you will automatically get the Koi Fish (non-denominational; secular). If a number of selections other than 1 or 3 is given, I will choose for you, either 1 or 3 and any excess selections will not be included. If that is not what you want, then please make sure to follow instructions precisely. If no specific name for the cover page is specified, then I will go with the first name of the payer for the day planner. If that is not what you want, then please make sure to follow instructions precisely. If no birth details are provided, then no birth chart will be included. If no time of birth is provided, then a sun chart set to 12:00 pm will be cast for you. If no location of birth is provided, then the default setting of London, England will be used. If no 2019 location details are provided, then the default setting for the 2019 solar return chart will be the location of birth. If that is not what you want, then please make sure to follow instructions precisely. Ha! Earlier today I was wondering if you’d be offering these again. Good timing! Love my 2018 one, btw. Are these still available to order for 2019?